- Medford Memorial Hospital is located in Malden, a small community in the north of the Commonwealth. 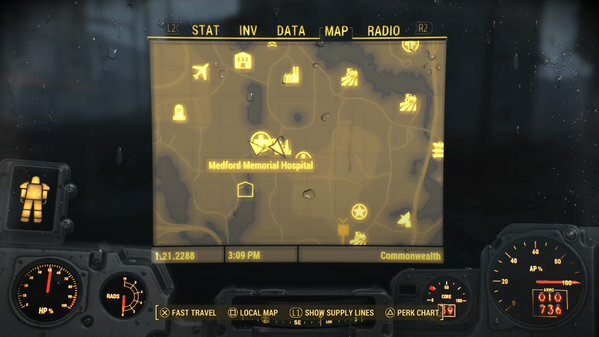 Head southeast - more east than south - from Sanctuary and you’ll find the Hospital just north of one of two prongs in the twisting river that runs northeast of Diamond City. You may find this place on your own, or you may be directed here by Scribe Haylen as part of a Quartermastery quest. - The Hospital is a tough nut to crack right off the bat, as it’s owned by Super Mutants. They guard the entrance and will attack anyone who comes near, and their numbers include a Suicider with a Mini Nuke. Target them from a distance, and, preferably, go for the Suicider first. It’s quite possible that the Super Mutants will be engaged in combat with Synths when you arrive, so hopefully you can take advantage of an attack. - The lobby of the Hospital seems quiet, but there are Super Mutants in rooms on the right and left - and the one in the left is a Suicider. Take him out first, if you can. Doing this will almost certainly bring down Super Mutants and Mutant Hounds from the upper levels, so be prepared for a bit of a scrap. - The Hospital is fairly open-ended past this point, so it’s probably easier to note things in a more freeform fashion from here on. We’ll do it by floor. Be sure to canvas this place for Vases of various kinds - they’re a great source of Ceramic, useful for crafting. There’s a Super Mutant in a bathroom in the west wing. There’s also an Advanced terminal that will open a safe right beside the terminal’s desk. Stairs in the rear of the wing lead to the third floor. The northern and western doors lead to an intersection, and beyond that a cafeteria with three Super Mutants idling inside. You can find a Vault-Tech Lunchbox in this room, sitting on one of the rear tables. The eastern wing contains a series of rooms with lots in ‘em, but nothing of terrible interest. Be prepared for confrontations in the narrow hallways, and be wary of Super Mutants rushing you with melee attacks. In the northeast you’ll find a desk; on it is an instrument case containing the Medford Operating Theater Key. Stairs in the north lead to the third floor. There’s an Advanced locked door to the west into a small storage room. There’s a Massachusetts Surgical Journal on the desk. The other, open door on this side leads to more storage rooms, and in the last one you’ll find a Fusion Core. The eastern door, which you can reach through careful shimmying, leads to stairs back to the second floor. There’s a side storage room here, protected by an Expert terminal, which contains a variety of medical goodies. Several adjoining rooms contain a slew of good crafting items and a Chemistry Station, though be cautious of a big ‘ol hole in the floor. The western door leads to a side room, possibly containing a Super Mutant on patrol, and the stairs back to the first floor. You can activate a Protectron near the door to the lobby. Maybe you like Microscopes, as well…? The northern door leads to the Operating Theater, for which you will need the Key, unless you can pop open Master locks. Beyond you’ll find a terminal which can switch on / off the operating lights, play some music, and open the nearby door into the Theater. There are a number of Super Mutants and Hounds inside, and if you switched the lights off you can better get the drop on ‘em. In the rear of the room you’ll find a steamer trunk packed with goodies, and beside it a few good guns, including a Short Syringer Rifle. The Operating Theater will bring your trek through the Hospital to a close. Have you ever been in a home where an infant is figuring out how to walk? On the off chance that you have, then you would realize that on the off chance that it were surrendered over to the guardians, particularly the mothers, they would put plumes all around the home with the goal that it can pad their fall.